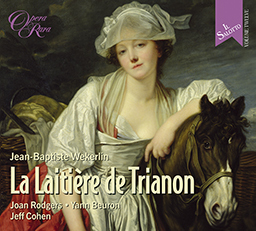 This recording focuses on a single work designed for intimate performance: J B Wekerlin’s ‘opérette de salon’, La Laitière de Trianon (The Milkmaid of Trianon). 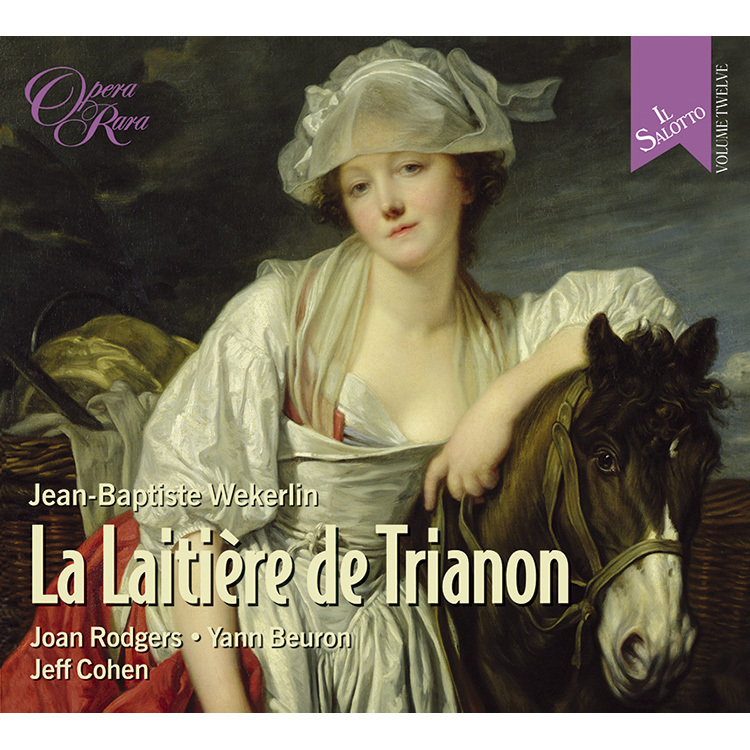 As with the previous Il Salotto issue, Pauline Viardot’s delightful chamber operetta, Cendrillon, this recording focuses on a single work designed for intimate performance: J B Wekerlin’s ‘opérette de salon’, La Laitière de Trianon (The Milkmaid of Trianon). Just two singers take part in the work, set at Versailles in 1775. The Comtesse de Lucienne (Joan Rodgers) and Marquis de Brunoy (Yann Beuron) have been betrothed by their families, though they have never met. As a colonel in the army, the Marquis is summoned to Versailles, though he confuses the military headquarters, Le Grand Trianon, with Le Petit Trianon, where Marie-Antoinette has established her model dairy. Here he meets a milkmaid (the Comtesse de Lucienne, in disguise) who takes his fancy. All possible misunderstandings ensue, which are, of course, finally and happily resolved. The composer, Jean-Baptiste Wekerlin (1821–1910), was a pupil of Halévy who spent much of his career as a distinguished librarian and editor of early French operas. However, his own stage compositions won much success in their day, with L’organiste dans l’embarras clocking up more than 100 performances. 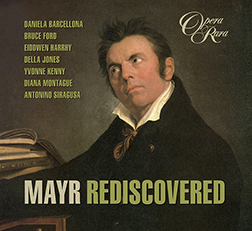 None of them had a more auspicious launch, however, than La Laitière de Trianon, which made its debut at one of Rossini’s soirées musicales on 18 December 1858.The recording includes three appendices: Hommage à Rossini, the original epilogue performed when the opera was first given at the home of Rossini on 18 December 1858; Madame de Lucienne’s Romance, originally sung in the 1858 version but not featured in the 1868 version and an Epilogue written when the opera was performed in a revised form at the home of Ambroise Thomas and his wife in 1868. 04 Il Saloto, Vol 12: Weckerlin, J.B.: La Laitière de Trianon: scene 1: Dialogue: Laitière! ? laitière de Trianon! 05 Il Saloto, Vol 12: Weckerlin, J.B.: La Laitière de Trianon: scene 2: Dialogue: A M. le marquis de Brunoy. Très-bien! 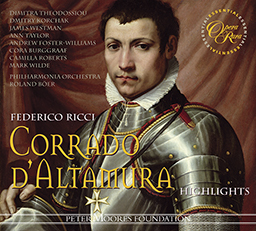 07 Il Saloto, Vol 12: Weckerlin, J.B.: La Laitière de Trianon: scene 2: Dialogue: Allons, allons ? tout beau, mes souvenirs! 09 Il Saloto, Vol 12: Weckerlin, J.B.: La Laitière de Trianon: scene 3: Dialogue: Eh bien, monsieur ? 11 Il Saloto, Vol 12: Weckerlin, J.B.: La Laitière de Trianon: scene 3: Dialogue: Oh! mais moi, c’est different ? 16 Il Saloto, Vol 12: Weckerlin, J.B.: La Laitière de Trianon: scene 4: Dialogue: Mais quel est son project? 19 Il Saloto, Vol 12: Weckerlin, J.B.: La Laitière de Trianon: scene 6: Finale: Je suis joué! c’est la comtesse! 20 Il Saloto, Vol 12: Weckerlin, J.B.: La Laitière de Trianon: Hommage a Rossini, G.: Messieurs ? 22 Il Saloto, Vol 12: Weckerlin, J.B.: La Laitière de Trianon: Epilogue: Messieurs, et vous aussi Mesdames ? The Comtesse de Lucienne and the Marquis de Brunoy, two cousins, have been betrothed by their families, though they themselves have never met. The Marquis, who is a colonel in Louis XVI’s army, is summoned back to Versailles, but upon arrival mistakes the Petit Trianon, where Queen Marie-Antoinette has just established her model dairy, for the Grand Trianon, the military headquarters. He meets a most charming milkmaid, and, little dreaming that she is the Comtesse to whom he is engaged, takes her for a real milkmaid. He tries to flirt with her, but soon decides that, if ever he is to win her, he must descend to her level. He consequently retires – and returns dressed as a gardener. The Comtesse, who has already discovered his identity, is amused to see him thus disguised, and, determined to keep the upper hand in their battle of wits, she too withdraws – reassumes her true rank and soon returns in her court dress. Their roles are thus neatly reversed. The Comtesse manipulates the situation to her own – and ultimately to their mutual – advantage, so that when all the misunderstandings are eventually resolved, they are both so strongly attracted to each other that they are only too happy to face life together as husband and wife.